As you've seen before on the blog, sometimes I eat someplace and only get one or two photos, not meriting a full blog post. So I collect these things, and then I share them all at once, and I'm reminded of these great meals that I ate! Here are more Nashville/Franklin-area eats for you to check out. Some of these pictures/visits were over the last few months, so menus are subject to change of course. The last of the M-Street restaurants I hadn't visited, Saint Anejo is really good! I definitely recommend the margaritas, and they have 2-for-1 specials on Wednesdays. As for the food, I haven't been to the brunch everyone talks about, but I joined a group of girls for a birthday dinner and really enjoyed it. The portions were huge; I took a good deal home with me to-go! The chips were crisp and tasty, and I had the Carne Mixto Burrito, which has steak and chorizo. They also threw in celebratory churros for my friend's birthday. 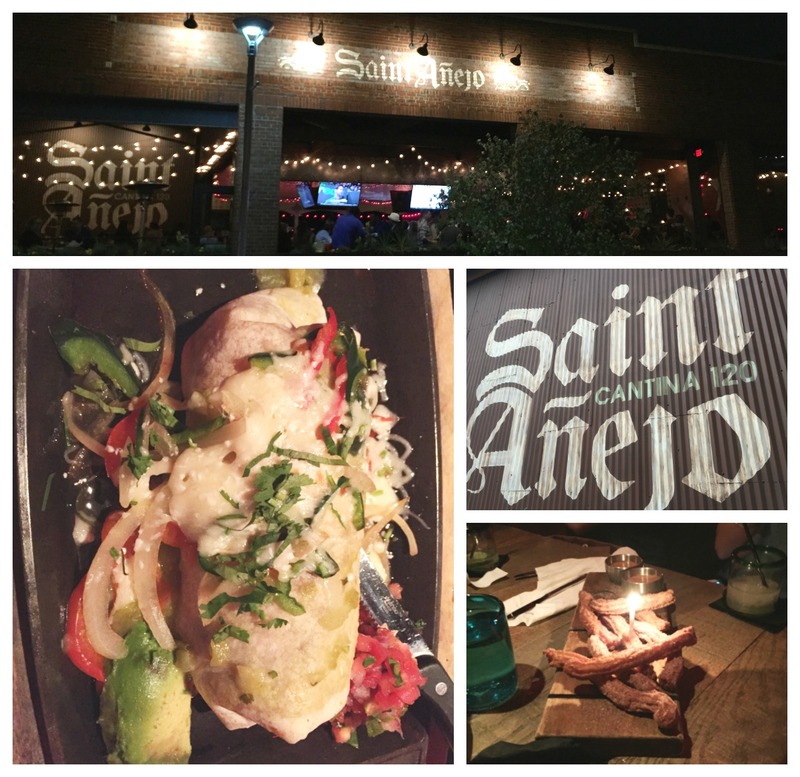 Overall, Saint Anejo has great people-watching, drinks, and food. If you believe all Mexican-ish food needs to be cheap, don't come here. The burritos are $12; this ain't Chipotle. You get so much more here, and it's upscale and hip. After all, it's the Gulch! There is a shopping center near our apartment that recently had a facelift, and they added some nice new things like a Sprouts store. Another newer addition to that center is The Neighbourhood Taproom and Kitchen, which replaced this old sports bar that used to have the same location. We rolled up for a drink and a late lunch one day, and I snapped a few pics. They have a large selection of beer on tap, to please just about any taste. Unlike places that are exclusively serving craft on tap, they had a lot of more mainstream beers available too. They also had sports playing on the screens, making it kind of a sports bar but with better ambience and class than the previous place had. We started with the Neighbourhood Bread, with pepperoni, which is basically a doughy flatbread pizza, with sauce for dipping. It was very good! The rest of the menu is primarily pizza, macaroni and cheese, and sandwiches/brats. Very much bar food. Dan really liked his brat, and I ordered a The Surfer Dude pizza. The pizzas are not small, probably just a little bigger than personal sized I'd say. I loved how doughy the pizza is, and the sauce was great too. It really was a good bite to eat, without frills. We'll probably be back, when we want some no-frills, sports bar type bites. I've written about Wild Ginger before on my blog, but that was back when I pretty much only ate dumplings and glazed fried chicken there. Since then, I've expanded my horizons, because they have an extensive menu that deserves a look! My roll of the moment is the Pink Lady, which has ahi tuna, mango, and avocado in it. The rice is bright pink from beet juice, stunning! I also love their pork belly bao buns, which are on their warm starters menu. They're big and packed with flavor, and the buns are sticky and doughy. Definitely a great starter. I recommend going with at least one other person, so you can get a few rolls and mix and match your tastes. Dan and I can usually eat a little more than one rolls each, if we get the appetizer beforehand. And you can always take home what's left. I pretty much only eat at Wild Ginger for sushi. It's fancy, it's nice, and I don't mind paying the price for that. Kate's Kitchen closed, and the owners reopened it in the same location as a new Mexican concept, Shot + Pepper Cantina. I went with my coworkers to check it out, since it's near our office. I think the best description of what I thought of the meal was that I was, well, whelmed? While their queso and salsa were both really delicious, some of the chips we got in our bucket were quite stale. And $7 is a lot to pay for queso. Service was relaxed, so kind of on the slower side for a weekday lunch. I decided to get the Chipotle Carnitas Tacos, which come with beans and rice. For $11, I got two tacos and the sides. I'm just not sure that what I got matched what I paid. While the food tasted alright, the restaurant seemed to kind of hover between wanting to be more upscale (like Saint Anejo, above) and still bringing some casual flavors. It was a bit pricy for a lunch, so I'll probably just go to Moe's or Chipotle to get my taco fix on weekdays. This location doesn't get the bustling margarita happy hour/people-watching that Saint Anejo has in the Gulch, so it just feels a little out of place. I like that they're trying to bring a new concept, but I won't be clamoring to get back. Food's okay, value for price feels a little off, and I think it's alright. Where do I need to eat next?